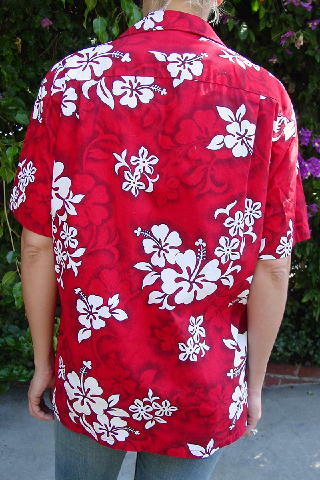 This short sleeve Hawaiian shirt was made in Hawaii by Pacific Legend Apparel. There's no fabric tag, but it feels like a cotton-poly blend. It has an open breast pocket and 5 brown speckled buttons down the front. There is a red background with tropical flowers and leaves in white and black. 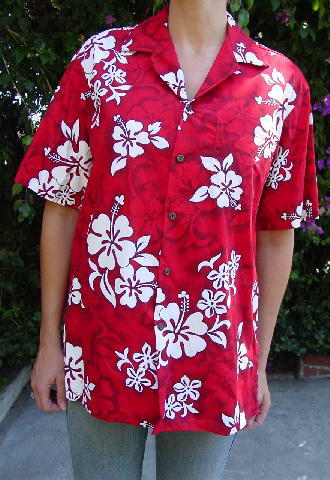 It was worn in a travel magazine photo shoot with the female model wearing the matching fabric dress. The stylist put an S on the shirt and dress label. shoulder to shoulder 19 1/4"